Now, hitsound and hitmarker are rather a bonus feature. 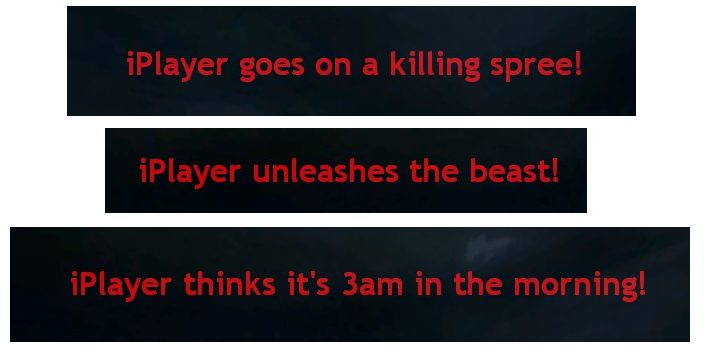 The thing about Killstreaker is that I combined both damage indicator and current killstreak message in one string. So that they don't conflict/overlap. The plugin also supports global (victim, attacker, teammates and/or enemies) sound and hud announcements for killstreak messages. Classic "Killing Spree", "Monster Kill" and "Wicked Sick" phrases will only appear on attacker's screen, right next to the damage done. Well, if you don't like this, you can easily alter translation strings for any phrase. Don't forget to download Quake Pack! It's not included in GitHub repository! 2. Download latest release of the plugin. 3. Extract sp-killstreaker-x.x.x directory to your cstrike folder. Main file of the pack is quake.json (instead of 'quake' there may be another name) which goes into cstrike/cfg/source-python/killstreaker/killstreaks. This file defines additional files (downloadlists and translations) and killstreaks themselves. To install a pack, download the archive and unpack its contents into your cstrike folder. Currently the plugin support only one killstreak scheme (pack) at a time. Clients are not able to choose from several packs in-game. After first loading plugin will create config file called main.cfg in your cstrike/cfg/source-python/killstreaker folder. There's not much to configure though. There's also a file called downloadlist.txt in cstrike/cfg/source-python/killstreaker folder. It's meant to hold paths to the sounds and materials (overlays) for this plugin. Last edited by iPlayer on Tue Apr 18, 2017 6:16 pm, edited 1 time in total. - Works fine but it seems there is a problem when I have disabled "spk_killstreak_enabled" (because I just want to see damages, not other things) : damages aren't displayed. If I put "0" to "spk_killstreak_visible_timeout", it steel appears. How I can do to see only damages? - Is it possible to disable "hud messages" too? - Can you add the possibility to display total damage at each end round? It was a bug. Anyways, I've updated the plugin. From now on it's called iPlayer's Killstreaker (with a basename of ip_killstreaker). AND open cfg/source-python/ip_killstreaker/downloadlist.txt and remove everything from it. It should be empty. Okay, I saw that coming. I will add it shortly. Weird. It runs fine for me on default settings. You're sure you unloaded sp_killstreaker and loaded ip_killstreaker instead? Any exceptions in server console? What if you don't change ipk_killstreak_scheme? Because in order to use quake pack again, you'll have to redownload it as some pathes have changes. Do you have the following output? 1. Does the damage indicator appear if you don't change ipk_killstreak_scheme? 2. Does it appear if you set it to "quake"? 3. Have you reinstalled Quake Pack from this link: https://mega.nz/#!PhQDnYhQ!p068copZSCKXFMeCiWOedjfrgU5VmJY15igeh9PWwjI? 4. Do you want anything besides damage indicator to be displayed on the screen? ipk_killstreak_enabled enables and disables the whole killstreak system, meaning that if you disable it, you won't hear any sounds; if you enable it, you'll get hud messages. This is the delay before multikills get registered. If you set it to 0, you won't get any double/triple/multi/mega-kills. Thanks, it work as I want now. Can you add this file in the quake folder and add description in the cfg file please? There is the addition of damage when I hit several times following, can you solve it please? I don't know if you see what I want to tell...?? I can add this file to quake-pack.zip, but I won't do any changes to the plugin's config files. Particular sound packs problems are unrelated to the plugin itself. Damage stacking was intended in the first place, I don't think there's much to "solve". As for damage stats at the end of the round, I will do it. iplayer i need only the hitsound can you help me? is the sound in HL2:DM.